At the heart of the problem is the shrinkage in the overall number of self-described humanities applicants. Expecting the Career Expo to be the start and finish of a job/internship search is a major mistake for any student, regardless of major. I was perplexed to hear Monday night that the University Court, faced with an election in which the Student Association disenfranchised a class of voters, nonetheless substantially upheld the results. Given today's social and political climate, I find the opposition to distribution requirements and, by extension, liberal arts education highly concerning. The first time I felt patronized and pitied because of my economic background at Rice happened in a conversation with a peer in the first few weeks of school. Letter to the Editor: Who does the SA work for? There’s almost no denying this Student Association election has been a total disaster. From the alleged intervention of non-university affiliated political groups to the recent mudslinging between the two major presidential candidates, this campaign cycle has begun to look more like a scene from a Michael Moore documentary than a student government election. To the Editor: As the faculty consider changes to the distribution requirements in the curriculum, I would like to advocate for what I consider the only sane proposal, the reduction of distribution requirements to almost nothing. For the first time in recent history, the Thresher decided not to endorse a candidate in the SA presidential election. Following two articles featuring the Women’s March in the Jan. 25 edition of the Thresher, the lack of mention of the March for Life, which occurred Jan. This letter is in response to “Invest in college facilities,” an op-ed in the Feb. 1 edition of the Thresher. Letter to the Editor: Where were they radicalized? To the Editors: The title of this piece popped into my head as I visited the Twitter page of the Texas Vanguard, the racist group said to have posted the white supremacist flyers around campus. 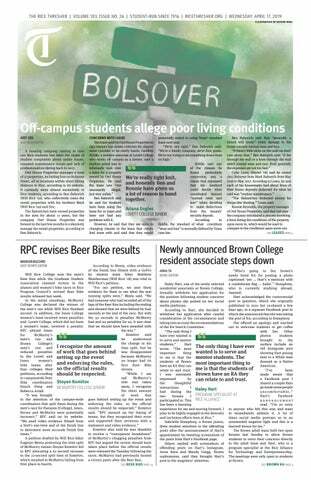 To the Editors: We were dismayed to read the content of the Jan. 25 edition of the Thresher Backpage.